I have heard that the opposite of love is fear, not hate, which may be first emotion that comes to mind due to the love/hate analogies we often make. If we go by that assumption, then someone who is fearless, or without fear, is someone who loves immensely. When asked by My Comic Relief to join in on the #FictionsFearlessFemales and write about a character from Star Wars, I immediately thought of Rey. Not Leia, like so many people often think of when they think about a fearless woman from Star Wars. Not Leia, but Rey. As I dove deeper into my own exploration of Rey versus Leia and why I think Rey epitomizes a fearless woman more, I realized that much of why I like Rey is due to her relatability. Leia is stone, Rey is warmth. It’s not to say that Leia is not fearless, but more that I believe Rey is easier for me to relate to in her fearlessness. That is how you are fearless. My past 6 months have been a whirlwind of horrible fear. In a nutshell, I have been bombarded with heavy subjects like drugs, addiction, overdose, death, and loss of money. I was not fearless. Even just writing this makes my heart rate rise and I get clammy hands. It was like an earthquake happened in my life. I am still dealing with aftershocks of this earthquake which namely include my lack of sleep due to hypnic jerks which leave me awake until 2 or 3am that happen night after night, physical symptoms that have been knots in my stomach for months so much so that I can’t distinguish happy or tense emotions from general anxiety, and pins and needles in my chest from sleeping in the fetal position every night. I am not fearless. I am fear-filled. To break away from fear, you need to love. You need to accept your limitations and others and love the life you have. Rey loves herself. I think she had to learn to love herself and be okay with waiting days on end for parents to return to her. This was part of her core and it gave her hope on Jakku. Even after the horrible realization that her parents were nobodies in The Last Jedi, she did not give into fear. Giving into fear would have been joining Kylo Ren because he would then represent the safety that she had been looking for in her parents. But Rey realized, or had possibly been beginning to realize through her training and with the mirror, that the safety and home she was looking for could only be found in herself. Loving yourself means having a strong conviction and not deterring from it. 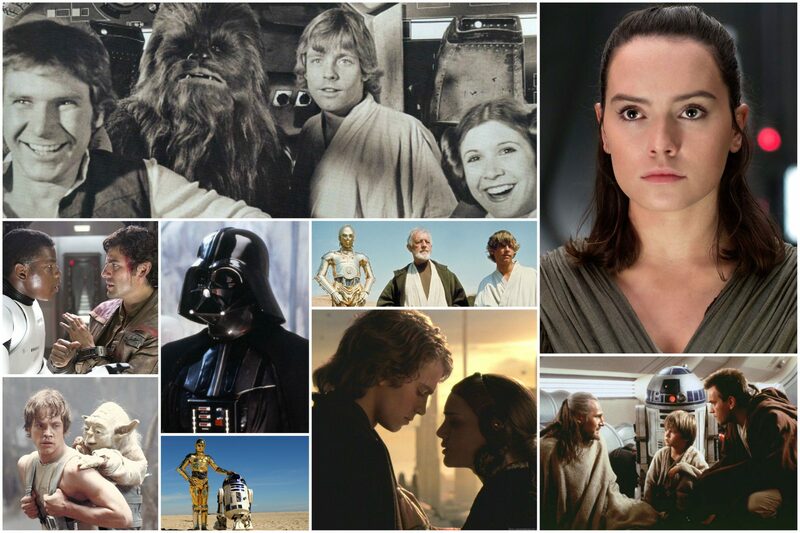 Rey shows that stronger than any other Star Wars character, except possibly Luke in the Original Trilogy. In The Last Jedi, we are bombarded with the message of the movie: hope. But I think the message of the movie is always doing what you think is right, no matter what others think. Rey exemplifies this throughout both The Force Awakens and The Last Jedi, but especially in The Last Jedi. I would not be able to continue to do what was right after being turned away by Luke. She followed her feelings and went to save Kylo, even if it didn’t work out. She went back to the Resistance, instead of going back to Luke at the end of the movie even though it may have made more sense to continue her training. She knew she was needed with the Resistance, to bring them hope again. Rey’s sense of self makes her more fearless than many people I know in my everyday life. Rey shows her love for others unabashedly. It’s one of the character traits that I aspire to – the fact that she can show her emotions and not fear her emotions. So often our society tells us to hide our emotions and Hollywood perpetuates this with their definition of “strong”. I think it is the main reason that I could not relate to Leia when I grew up but related more to Luke. The one scene that I would act out over and over again when I was younger was when Luke tells Leia about Vader being her father. It’s the one scene where she lets her guard down, where her emotions overtake her and she needs to be held by Han at the end. It’s a glimmer of emotion. I immediately connected to Rey after the first viewing of The Force Awakens. She laughs with such joy over simple fixes in the Millennium Falcon, her excitement over meeting Han Solo is so real, and her devastation over Finn’s possible death and serious wounds tugged my heart strings. Rey wears her heart on her sleeve and I love her for that. She continues this in The Last Jedi. Her anger at Kylo erupts from her when she yells at him for not appreciating his father, her frustration with Luke at his unwillingness to help culminates in physical fight, and her delight in seeing Finn at the end of the movie reminds us of her loyalty to her friends and the Resistance. I hope that we see more women like this in movies as Hollywood continues to evolve. Not only for women, but also for men. It’s okay to cry and it’s okay to be unrestrained in your joy. We don’t need to act like toddlers with no control whatsoever, but we need to get over our fear of showing our emotions. We need to become fearless, like Rey. We love life by walking through it without fear holding us back. We take leaps of chance, hoping it turns out okay, and if it doesn’t, knowing that we will be okay in the end. When you’re filled with fear, you don’t follow your passions, it’s hard to make attachments and your focus is keeping yourself safe. While safety is important, if we are always full of fear about something happening, we miss out on the beauty life offers us. Rey waited around on Jakku for her parents to return for a long time and with a lot of patience. But when Finn and BB-8 were thrown into her life, she accepted the change and went along with what life threw at her. She had an adventure of a lifetime. Rey loved herself enough to know that she would harness life and try new things without fear. She felt the Force, and used it to get out of her jail cell. She went off in search of Luke Skywalker and stayed there until she knew life was pushing her in a different direction. Rey could have stayed on Ahch-To long past when she left, insisting on doing things the “right” way and getting a complete training. But instead, she followed a different path and believed that life and the Force would take her where she needed to be. We may not have the Force, but we do have gut feelings. We are only given one life, as far as we know. Don’t give into the fear of feeling like nothing will work out and that you need to remain safe. That is a fear trap. If you made it to the end of the post, I hope you are swayed on how Rey is fearless, and perhaps more fearless than Leia. Today is my birthday and while I was writing this, I knew that this next year had to be one of less fear and more love. To stop worrying because what will be, will be. I no longer want to feel the chains of fear, but instead to have more conviction in my beliefs, show more emotion, and take chances that throw me into an adventure. In short, I hope to be more like Rey and be FEARLESS. I’ve joined forces with some other exciting bloggers and YouTubers – Nancy and Kathleen of Graphic Novelty2, Rob of My Side of the Laundry Room, Jeff of The Imperial Talker, Kalie of Just Dread-full, Mike of My Comic Relief and Green Onion of The Green Onion Blog – for a little salute to “Fiction’s Fearless Females.” Starting on International Women’s Day and going forward over the next couple months, a different contributor will offer their take on a favorite female who harbors a fearless spirit. Click on the links below to read about the other women being profiled. I think in addition to Rey being fearless, so are YOU! You’ve dealt with a lot and will come out stronger. Happy Birthday, and may this year be your best yet! Ohhh this might be my favorite post you’ve ever written. I love your philosophy on being fearless. And of course, I love Rey as a character so much. (I always related to Luke more than Leia also.) I’m happy you got an Ep IX pic to use in the post too haha. I see Rey as a lot like Wonder Woman (another Fearless Female) in that her emotions are shown as a strength and not a weakness. Oh wow a favorite?? I’m honored! Quite a few people have told me how they’ve connected to this post, so I’m glad! I’ve been wanting to write a post on why I live Rey more than Leia for a while and dig down into it but this actually came out in a nice way. And yes, I totally had to use a trailer pic and actually went back into the scheduled post to change it… Which is a big deal for me! An inspiring post and does justice to Rey. It’s sometimes easy to ignore the strengths of Rey compared to say Leia – maybe because she is such a new character, and Leia has had a long time to stamp her authority? All I know is that when I first saw Rey on the screen I instantly warmed to her, was drawn to her. Her second outing continued with that feeling for me. Now I look forward to her third adventure. I like her bravery, her sense of being this loner and survivor yet easily able to work with others. I also like her deadly seriousness and how she applies herself to her tasks, which is nicely balanced with the odd glimpses of fun and humour. A great character.